"This is the perfect side for anything from a casual backyard BBQ to a formal holiday meal. You'll never want to eat regular cole slaw again." Crush the ramen noodles in a bowl, and stir in the beef seasoning packet, sunflower seeds, almonds, green onions, oil and vinegar dressing, and sugar, mixing until the sugar is dissolved. 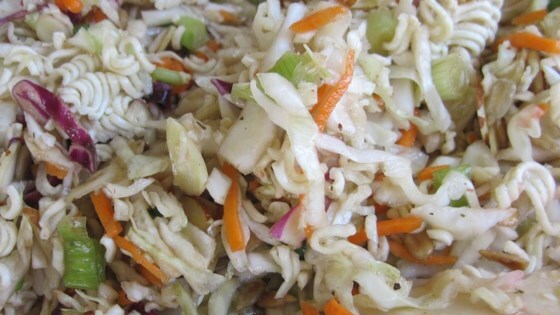 Place the coleslaw mix into a large salad bowl, pour the dressing mixture over, and toss lightly to combine well. Refrigerate at least 1 hour before serving. Great! next time I won't add the crunchy noodles until I'm ready to serve the salad...they got a little too soggy. I used 1/2 cup rice wine vinegar & 1/2 cup sesame oil. I didn't use sunflower seeds just the almonds but I toasted them first. This kept them crunchy & gave extra flavor. I think several people have mentioned using the Newman's Own Light Sesame dressing instead. This is DELICIOUS. I get compliments every time I make it and requests for the recipe. It's awesome.